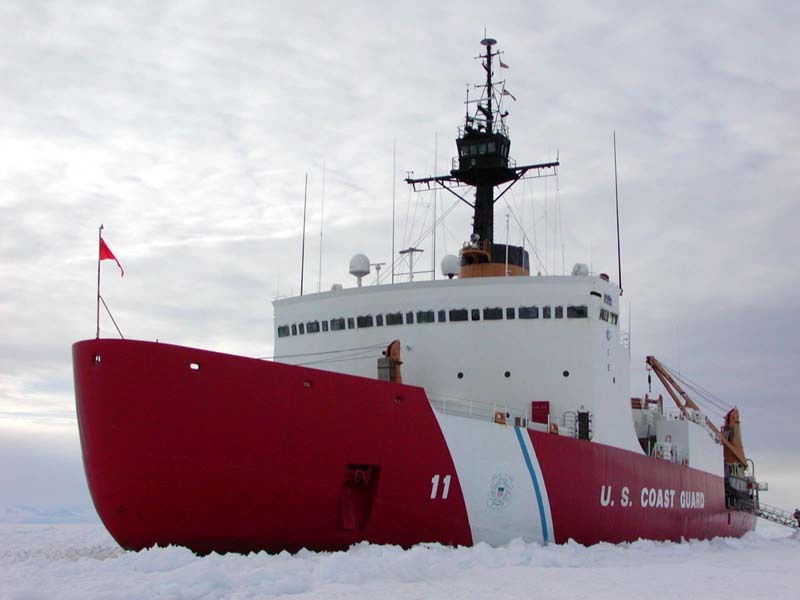 USCGC Polar SeaThe US Naval Institute reports the Coast Guard has issued a draft Request for Proposals for a new Heavy Icebreaker with options for two more. Certainly good news to see the process moving along, but it is also important to remember what it is not. Like all of our contracts so far, there is no apparent consideration of a block buy that would lock Congress into funding the entire program–three ships in this case. Perhaps an astute shipbuilder will include that in their ultimate response, in case the Congress wants to commit for all three. They will be provided with the means to be upgraded to allow them to exercise both self-defense and a modicum of offensive capability. The House Subcommittee on Coast Guard and Maritime Transportation hearing recorded above is a follow-on to one already discussed. The video does not actually begin until minute 10:40. It is basically done in two parts as indicated below. Elsewhere the Coast Guard reported on the Commandant’s testimony, but what we really need to listen to is what the Congressional Sub-Committee members are telling us. They seem to love and respect the Coast Guard (you may have noticed Congress keeps giving us more than we ask for), but they are not pleased with the planning documents they are getting from the Coast Guard. I would particularly recommend you watch the opening comments of Representatives Hunter (10:40 to 13:30), Garamendi (to 17:00), and DeFazio (to 21:20). It will probably make you mad. You should be mad. We have to identify the problem and fix it. 27:00 Great Lakes icebreakers, line item for design of a Great Lakes Icebreaker is being budgeted but no plan for buying one. 29:30 Five Year plan “reflects Fiscal guidance.” That is, we are being told, we have to fit our budget request into predetermined ceilings, so it is less than we really need. 35:00 We are asking DOD to fund six FRCs CENTCOM has requested to replace the 110s currently assigned. 37:00 Graph comparing AC&I funding as requested, authorized, and funded. 39:00 Twenty year plan which was due to Congress at the end of June has not been submitted to Department. 44:00 DOD does not see icebreakers as a National Defense resource. Navy will not pay for the first icebreakers. 54:00 Strong support for icebreakers among the representatives. 57:30 Question on icebreaker lease. Ice trials issue still on the table. 1h09 Why not a block buy on the first ship? 1h34m.Particularly watch Ronald O’Rourke’s testimony, he suggests accelerating the OPC program may be an alternative to WMEC life extension program. 1h43m Sub-Committee liked getting the fleet mix study, but that was several years ago. Block Buy Report due in Dec.
Expected cost of heavy icebreaker has dropped about $200M. 2h07m again, “no military requirement for an icebreaker.” Representatives feel that question should be studied. 2h15m if we wait a number of years between the first and second WAGB contract results in loss of expertise and additional cost. whether we should build three or four heavy icebreakers. Three or four heavy icebreakers: The proposal to build four heavy icebreakers rather than three came from a study by the National Academies of Sciences, Engineering, and Medicine. It is largely based on the reasonable assumption that heavy icebreaker #4 will cost less than medium icebreaker #1, as a result of the learning curve savings on heavy icebreakers and first of class costs for the medium icebreakers. I have not read the study but they don’t seem to have addressed the question, of the need for a total of six icebreakers found in the high altitude study. Assuming we build four of a single class of icebreakers, should we then start on a new class of two medium icebreakers with its attendant start-up costs or should we go ahead and build six heavies? Block Buys for OPC and Icebreakers: The Congress has authorized the Coast Guard to use “Block Buy” funding for its shipbuilding programs. The Coast Guard seems hesitant to even ask to do this. In the case of the OPC, it might save us more than $1B. We could have (and I believe should have) asked to use multi-year procurement for the second phase of the Webber class WPC buy, but we did not. The National Academy of Sciences study recommends we use block buy procurement for four icebreakers. The current contract for the OPCs is a contract for the first with options for eight more to be funded through FY2023. Until the options are executed we have the option of seeking a block buy contract for future construction. Block buys commit Congress to fully fund all vessels included in a program to the extent of the contract. If they back out there are penalties incurred. From the Coast Guard’s point of view it would seem a commitment from Congress would be a good thing. Because of that commitment, shipyards are likely more willing to invest in productivity improvements, resulting in lower costs. The Commandant’s remarks on the Icebreaker seem to indicate we will wait until we finish and evaluate operations of the first new Polar Icebreaker before seeking funding for a second. If that happens not only will we miss the potential savings of the a block buy, we will also lose the experience the shipyard gained building the first. Long delays between the first few NSCs was largely why we did not see a significant price drop after the first ship. We still have a very long way to go before we can achieve the Program of Record. There has been no meaningful test of the “Crew Rotation Concept” in spite of the fact that virtually every test of rotating multiple crews among multiple ships has proven problematic and has failed to realize the claimed benefits. Aircraft are also not achieving utilization hours planned. The OPCs, if constructed as currently planned, will not be completed until 2034. If five-year plan is subject to “fiscal guidance” then why would the 20 year plan not also be subject to “fiscal guidance.” If we are to provide a true picture of what we need we need to change what we are doing. We need to know what we need. We need to know the consequences of not getting what we need. We need to be able to communicate both what we need and the consequences of inadequate funding to the Congress and Administration. As noted in the introduction to the executive summary of the Offshore and Aviation Fleet Mix Analysis. To support its role as Systems Integrator (SI), the Coast Guard (CG) needs to establish and continually update a strategic plan for the acquisition, operation, and sustainment of capabilities necessary in achieving organizational goals. Key to this strategic plan is a repeatable, comprehensive process that identifies alternative capabilities and Fleet mix solutions that will meet future mission requirements in an efficient, effective, and affordable manner. This should not be a one time thing. We need to do this regularly as a repetitive process that is improved over time. We also really need to look at alternatives, not just already chosen solutions. Once we know where we want to go we can come up with a 20 year (or better yet a 30 year) plan, beginning with what are we going to lose. It might be best if the long-term plan did not include cost figures. Then we don’t have to comply with preconceptions of cost limits. Identify generic platform types with the capabilities we need.